Review of Draft Day Sports: Pro Football 2016 - Is their first dance together a good one? All in all, DDS: PF 2016 is absolute gem if you want a game that you can customize and craft to your liking. 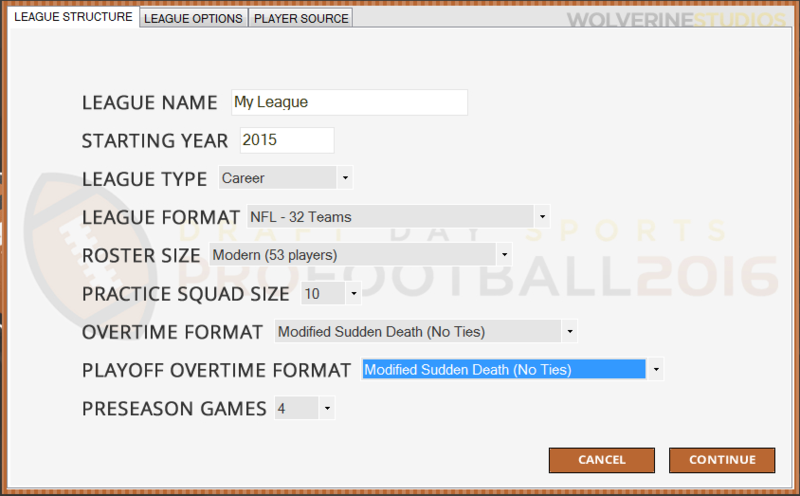 DDS: PF 2016 is the long-awaited American football text simulator from Wolverine Studios. The lead developer is none other than Brooks Piggott who decided to merge his Barcode Games’ Professional Football Simulator franchise with Wolverine Studios in 2015. The move seems to make a lot of sense as a seasoned developed in Brooks Piggott locks arms with a seasoned publisher/developer in Wolverine Studios. From the start, you’ll notice that DDS: PF 2016’s user interface provides a clean, no-frills experience. The text in the menus is easy to read and the transitions between screens feels pretty smooth overall. I never found myself having to wait too long to get the information I needed. The game doesn’t employ movable data widgets, but rather provides you with a host of tabs to click through to find everything from league stats to league history to a “My Team” tab where your specific team’s information is located. 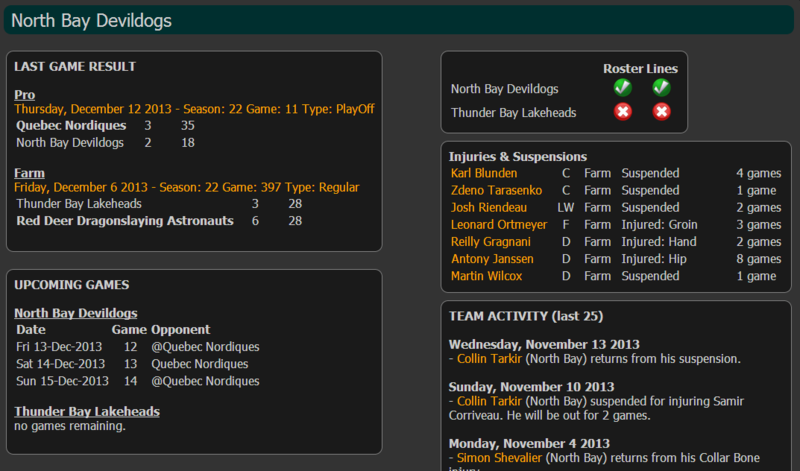 Once you click the “My Team” tab, you are then taken to a team home page which provides you a lot of helpful information in one place ranging from your current standings, injuries, team transactions, team stats, schedule and even draft picks. This is all well and good, but overall, the user interface felt a little cluttered to me. There are just too many tabs to click through to find the information you want. Some merging of tabs could help streamline the user’s experience. Like the “My Team” tab, the game’s player cards are packed with lots of helpful information with various tabs allowing you to view a player’s attribute & personality ratings, stats, records, streaks, rating progression and more. It’s also nice to be able to edit a player’s ratings directly from his player card, though it would have been helpful to be able to edit a player’s photo from there as well. I also wish the game would have allowed me to activate/inactivate a player from his player card or even release him instead of having to open another tab to complete this basic management task. The in-game graphics are a combination of text-based play-by-play and 2D overhead replays. Personally, I didn’t find the 2D replays to be particularly engaging or memorable to watch, but it does bring the on-field action to life a touch more than just scrolling text. In fact, you are able to pause & play the 2D replays, speed them up or slow them or down or just skip each one altogether. Also, because any particular game has also already been simulated, you can easily exit out of the in-game screen at any time if you don’t feel like watching any more. You’re not stuck having to watch or quickly simulate the rest of the contest. Overall, DDS: PF 2016’s graphics and user interface is simple, clean and functional. Honestly, it looks a lot like Professional Football Simulator, DDS: PF 2016’s predecessor. That’s not necessarily a bad thing, unless you were expecting a giant leap forward graphically in the game’s transition to Wolverine Studios. 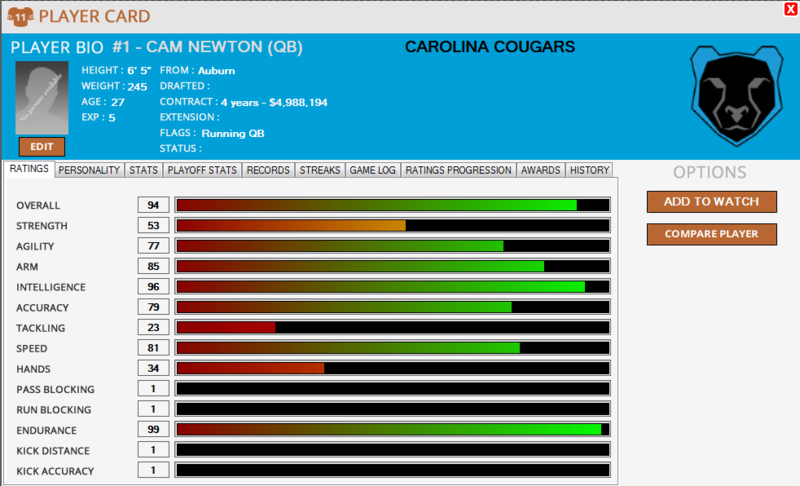 Otherwise, the game’s present user interface and graphics gets the job done for a sports text-sim. In terms of customization, DDS: PF 2016 has a lot to offer. The game comes equipped with a large bevy of league formats – everything from the modern 32-team NFL to the 8-team CFL to a long list of custom league options. Want to have a 6 team, 14 game custom league? No problem. Want to have a mammoth 72 team, 16 game custom league? Yes, you can even create that monstrosity. DDS: PF 2016 also nicely gives you the option to either begin as the GM of one particular team or start play in a “Sandbox” mode where you can act as the commissioner of the league. 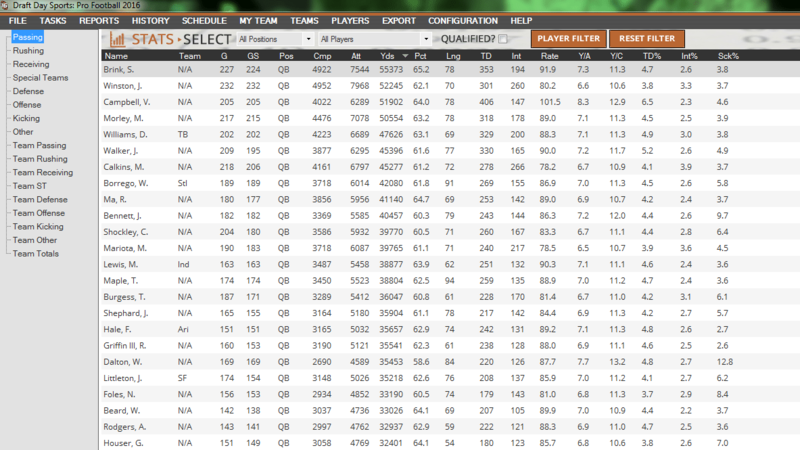 You can even sim multiple seasons to build up a statistical base for your league before taking control of one team. DDS: PF 2016’s flexibility in creating different kinds of leagues with their own unique histories is impressive. Beyond flexible league formats, DDS: PF 2016 also allows you to tweak roster size, practice squad size, overtime format (regular season & playoff) and the number of preseason games. You can precisely adjust the salary cap for your league, set maximum and minimum contracts and even gives you an option to play without finances if that suits your fancy. Also, with DDS: PF 2016 you can start your league either with real NFL rosters dating back to 1920, a custom roster file or CPU generated players. 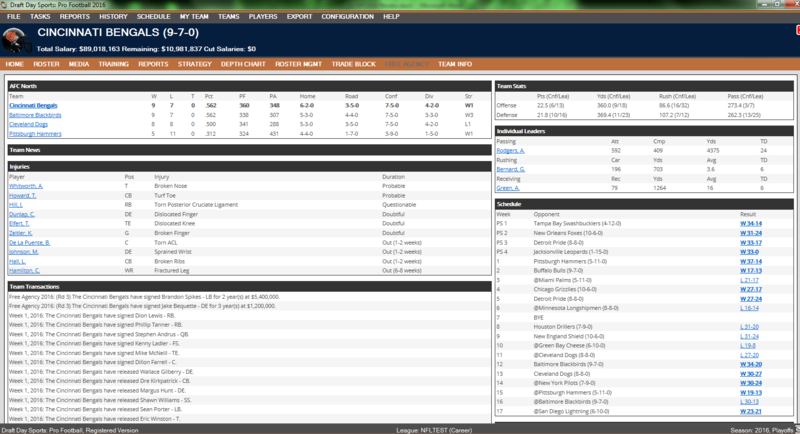 You can also begin your league with a draft or have players automatically assigned to teams. However, DDS: PF 2016’s customization options don’t stop with league creation. The game also makes it possible adjust many of these options once your league has already kicked off. Want to start an NFL league in 1975 and adjust the overtime rules over time? You’re free to do that. Want to adjust the Hall of Fame criterion so players need at least 35,000 passing yards to get into Canton? Go ahead. Finally, as mentioned previously, DDS: PF 2016 also give you the ability to edit player info and ratings directly from the player’s card. You can also edit team names, team colors, team logos (including end-zone art & midfield logo), and their field type. So, DDS: PF 2016 looks decent, has a lot of customization options, but how does it play? Well, for starters, DDS: PF 2016 is a very stable game. In my time with the game, I cannot remember one time when it crashed or locked up on me. I also really appreciated the zippy load and save times. The loading does seem to slow down a bit when you’ve simmed multiple seasons, but the loading times never seemed unreasonable for a text-sim. However, once you load up your game and start poking around, not everything is as smooth or simple. One of the first roadblocks you’ll run up against is the glaring absence of any manual or tutorial in the game. The game has a “Help” tab, but there is no help file! So, if you want to understand the intricacies of training or understand what impacts a player’s morale or understand what a player’s “Disposition” rating has to do with anything, then you’ll either have to engage in a lot of guess-work, inquire on the Wolverine Studios forum or just go without. The lack of a help file, even a barebones one, is very puzzling and simply inexcusable. But how does the rest of the game play out? Well, DDS: PF 2016 has some real highlights mixed with a few real lowlights. 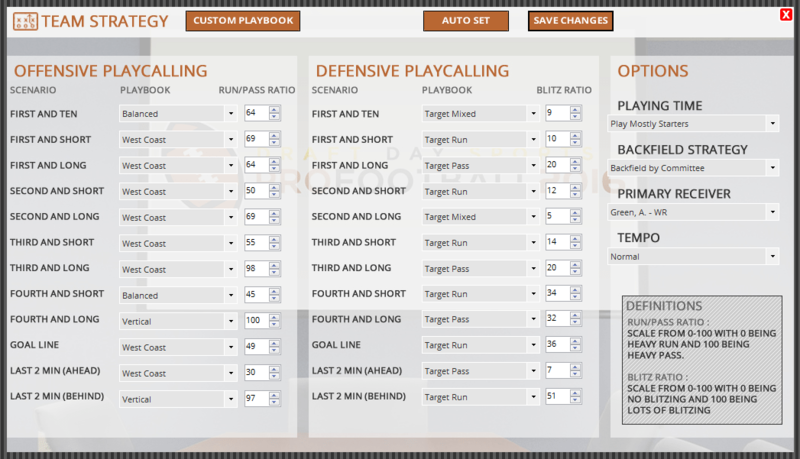 In terms of highlights, DDS: PF 2016 does a good job giving you strategic options to impact your team’s offensive and defensive play-calling without making it seem overwhelming. For 12 different scenarios on offense and defense, the game allows you to pick the playbook you’ll be operating out of and the run/pass ratio (offense) or blitz ratio (defense) you will employ. You can also tweak things like playing time (mostly starters, balanced, mostly back-ups), your backfield strategy (primary back or by committee), your primary receiver and your team tempo. You can also “auto-set” these strategy options if you’d like to as well. As someone who enjoys primarily operating as the GM of the team, but also likes tweaking the actual play of my team from time to time, I felt like DDS: PF 2016 provided a good balance of micro and macro decisions to make. Sometimes in an effort to be uber-realistic, text-simulators can provide you with so many strategic options that they become cumbersome. DDS: PF 2016 doesn’t fall into that trap. Another highlight in DDS: PF 2016 gameplay is their attempt to model player training during a season. For each player on your team, you can select how much time they spend at positional drills, athletic training, physical training and game tape. You can also create custom schedules for groups of players (i.e. Running-back training schedule). Then during the course of the season, you will receive emails about the impact of your training schedule on your players. Some players will complain about their schedules. Some will get worse in some areas and stronger in other areas. All of this really has the potential to make it feel like your team is filled with real people who are changing, adapting (and complaining!) as the season goes on. However, the in-season training feature could be better optimized. For one, the game isn’t particularly transparent about what player ratings are impacted by each training area. What’s the difference between physical and athletic training? I could guess, but why not just explain it to me on the training screen? Also, during the course of the season, the training result emails you receive could provide more information about how particular attributes were impacted. Instead of just blindly telling us that a player’s strength improved, I wish the game would have told me by how much (i.e. +2 strength, -1 speed, etc.). Still, player training is a highlight in DDS: PF 2016 and shows a lot of promise for the future. However, sadly, DDS: PF 2016 gameplay is not all roses. There are a few lowlights. Let me walk you through a few. First, DDS: PF 2016 struggles to realistically capture the financial climate of the NFL. I appreciated that the game provided room for max and minimum contracts, a salary cap and even a penalty for dropping players. Well done. However, for some odd reason, the game doesn’t come pre-packaged with an accurate salary cap model for the NFL. Instead, if you run with the game’s default salary cap, you’ll find yourself paying Andy Dalton $1.1 million per year when in real life he is pulling in $16 million per year. And even after doing a 30 year sim in one test league, I found that the top quarterbacks in the league were only making about $8 million per year. This isn’t even close to what star NFL quarterbacks make today. The lack of realism and attention to detail in terms of contracts and the salary cap was disappointing. Second, DDS: PF 2016 suffers from a questionable player development model. While players do seem to improve and regress as the years go by, they don’t seem to do so in a way that is truly realistic to the NFL. For the most part, it appears that the bulk of a player’s ratings stay at about the same level for most of their career and then perhaps trail off toward the end of their career. I’m not sure this accurately reflects the NFL where players can improve and regress for all sorts of reasons (i.e. injuries, morale, coaching, etc.). Just because a player is budding super-star doesn’t mean he will be a super-star for the majority of his NFL tenure. DDS: PF 2016 doesn’t appear to provide enough variability in its player development arcs. This questionable development model in turn impacts the statistical engine for the game. While on average, game seems to pump out somewhat realistic NFL stats per season, you can sometimes see good players consistently producing strong stats over the course of their entire career. For instance, is a 35-36 year-old Odell Beckham Jr. really going to pump out a 78 receptions, 1751 yard season with 20 touchdowns? Not likely in today’s NFL. Or is a 36 year old Le’Veon Bell going to churn out a 209 carries, 1027 yard season with 6 touchdowns? Again, not likely in today’s NFL. But with DDS: PF 2016 current development model, this is what you might see, at least with current NFL players aging. Third and finally, DDS: PF 2016 lacks a variety of other features that could make the game more interesting or immersive. For instance, there are no coaches found in the game. You cannot hire or fire anybody. There are also no scouts in the game. So, there is no need for a draft combine, because you already get to see every prospects’ ratings up-front. Players also don’t appear to come with an injury rating that adjusts over time based on a player’s injury history. Do you go after that injury-riddled, but still talented running-back in free agency or spend your money on a safer, but less-talented option? This level of strategic decision-making is currently missing from DDS: PF 2016 and really takes away from the overall GM experience. DDS: PF 2016 also doesn’t give you the option to call plays in-game. Rather, you set your strategy and then watch as a spectator to see what happens on the field. Although I don’t usually coach a lot of my text-sim matches, it’s also nice to have the option or even be able to interrupt a game sim to make a decision at a critical point in the game. DDS: PF 2016 doesn’t give me that option and it’s disappointing. Finally, there are no owner goals in the game. I am not even sure you can get fired in this game. Rather, you can switch teams at any time. For some, this might be ideal, but if you want to be held accountable for sloppy management, you will be less than thrilled. When it comes to online play, DDS: PF 2016 definitely rises to the occasion. In fact, similar to Professional Football Simulator, it feels like DDS: PF 2016 might play best as an online league simulator. For instance, the game supports online leagues with the various league structures previously mentioned. 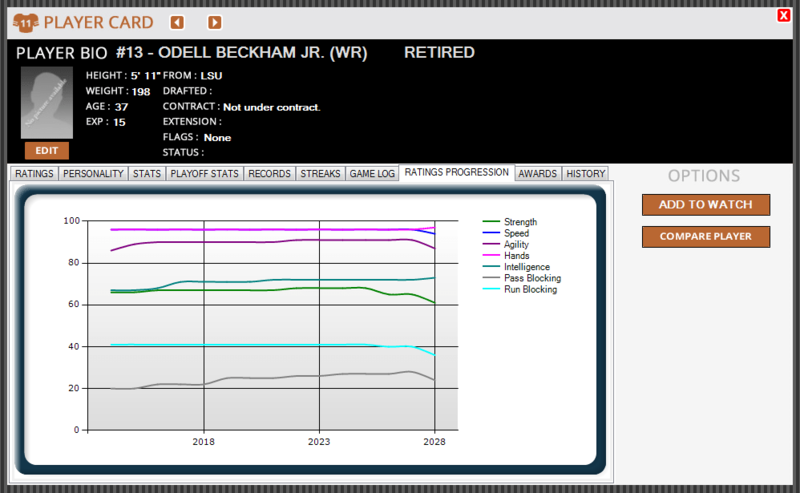 You can also generate HTML screens and Access/CSV files with information about your league. There is also an array of online leagues already operating, and these can be easily accessed through the Wolverine Studios forum page. So, if you’re into online multiplayer and you are satisfied with its current gameplay options, DDS: PF 2016 will definitely scratch your itch. Waiting can be hard. You want something badly, but it’s not here yet. You have to wait. Just a little bit more. But then – the moment finally arrives. Your waiting is over! You can enjoy what you’ve been waiting for. Everything is good, right? Well, that depends. It depends upon whether what you’ve been waiting for was worth it. Is it? What if it’s not? What if it doesn’t live up to your expectations? What if you feel like you should have waited a little longer? So, waiting can be hard, but having to wait longer for what you’ve already waited for can be even harder.